This management agreement form documents the business relationship between a dental group practicing dentistry and a dental practice management firm which will manage the non professional aspects of the practice. 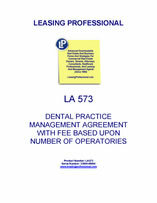 In this particular arrangement, the management fee is calculated upon the number of operatories (i.e., the number of dental chairs) present in the practice. The practice will be operated from several offices. Duties of the manager include arranging for equipment, supplies, non-dentist personnel, provision of office and clinic space, financial record keeping, and patient billing and collection, among other duties. The agreement specifies the authority and responsibilties of the practice manager for the administration and business management of the dental practice. The practice of dentistry is the exclusive domain of the dental group practicing dentistry under the agreement. The practice includes orthodontics and all related dental care services. THIS DENTAL PRACTICE MANAGEMENT SERVICES AGREEMENT (“Agreement”) is entered into effective _______, 20__ (the “Effective Date”), between Professional Management Company, a _________ corporation (“Management Company”), and Dental Practice Group, a ________ professional corporation (“Group”). A. Group engages in the practice of dentistry and the provision of Dental Services in the state of _________ (“State”). B. Management Company provides nonprofessional business support and management services to dental practices. C. Group wishes to engage Management Company to provide certain business support and management services necessary and appropriate for the day-to-day administration of the nonprofessional aspects of the Practice, and Management Company desires to provide such services all upon the terms and conditions set forth in this Agreement. 1.1 Affiliate. “Affiliate” means, with respect to any Person, (i) any individual or entity directly or indirectly owned or controlled by such Person, (ii) any individual or entity directly or indirectly owning or controlling such Person or (iii) any individual or entity directly or indirectly owned or controlled by the same individual or entity as owns or controls such Person. For purposes of this Agreement, neither Group nor Management Company shall be deemed an Affiliate of the other. 1.3 Dental Services. “Dental Services” means (i) all professional dental services that, pursuant to the laws of the State, must be performed by a licensed dentist and (ii) all dental-care related services that, pursuant to the laws of the State, may be performed by dental auxiliaries, such as dental hygienists and dental assistants, but only if such services are performed under the general supervision of a licensed dentist. Dental Services shall include, without limitation, the practice of dentistry (general and specialist), orthodontics and all related dental care services provided by Group through Providers and dental auxiliaries. 1.4 GAAP. At any particular time, the term “GAAP” means generally accepted accounting principles, consistently applied, as in effect at such time. 1.5 Operatories. “Operatories” refers to a complete system consisting of a dental chair, lights, cabinetry and related equipment and delivery systems necessary to provide Dental Services. For purposes of this Agreement, the number of Group’s Operatories shall be equal to the number of patient dental chairs located at the Practice for the purpose of providing Dental Services. 1.6 Person. “Person” means any natural person, corporation, partnership or other business structure recognized as a separate legal entity. 1.8 Provider. “Provider” means each licensed individual who provides Dental Services and related services to patients of Group (e.g., licensed dentists and dental hygienists) and who is employed by Group or who provides services to Group on an independently contracted basis. 1.9 Management Company. The definition of “Management Company” in the first paragraph of this Agreement shall include any Person that succeeds to Management Company’s interests hereunder and to whom the obligations of Management Company hereunder are assigned and transferred in accordance with the terms of this Agreement. 1.10 Services Fee. “Services Fee” is an amount per month equal to $ multiplied by the number of Operatories at the Practice locations on the first day of the month. 2.1 Appointment. Group hereby engages Management Company to provide the Business Support Services, and Management Company hereby agrees to provide such Business Support Services, subject to all terms, conditions and provisions of this Agreement. Consistent with the provisions of this Agreement, Group hereby gives Management Company all necessary authority to provide Business Support Services for Group. Group expressly acknowledges and agrees that Management Company may coordinate and contract with Affiliates, and third parties, for the performance of the Business Support Services. 2.2 Group’s Ultimate Responsibility. As required by applicable laws, regulations and rules of State governing the practice of dentistry, Group shall retain ultimate responsibility for all activities of Group that are within the scope of a Provider’s licensure, and cannot be performed by Management Company due to Management Company’s nonlicensed status. Accordingly, Group shall have sole responsibility and authority for all aspects of the practice of the profession of dentistry and related professional services and delivery of Dental Services to patients of Group by its Providers. Group shall also retain ultimate responsibility for the management of the Practice (including all business aspects of the Practice), and nothing in this Agreement is intended to transfer such ultimate responsibility from Group to Management Company. Nothing in this Agreement shall be construed to alter or in any way affect the legal, ethical and professional relationship between and among Providers and the patients of Providers, nor shall anything contained in this Agreement abrogate any right or obligation arising out of or applicable to the Provider-patient relationship.